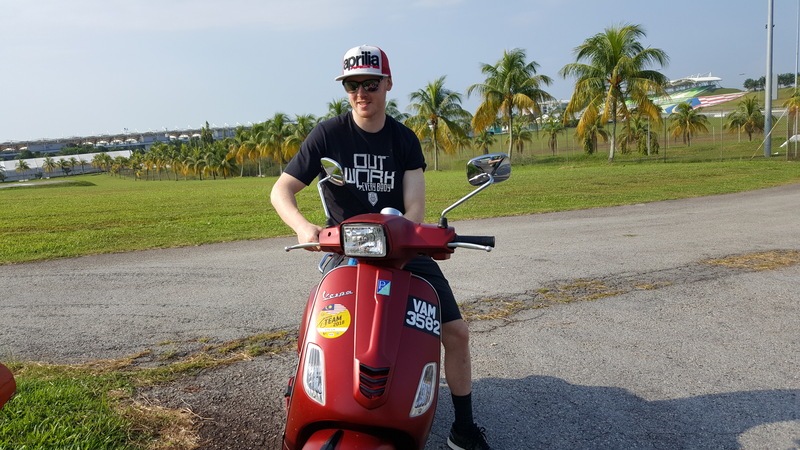 Thirty minutes trackside with Bradley Smith at the Sepang MotoGP test. Bradley Smith has always been one of the main go-to guys for the media when it comes to explaining the intricate details of MotoGP riding. 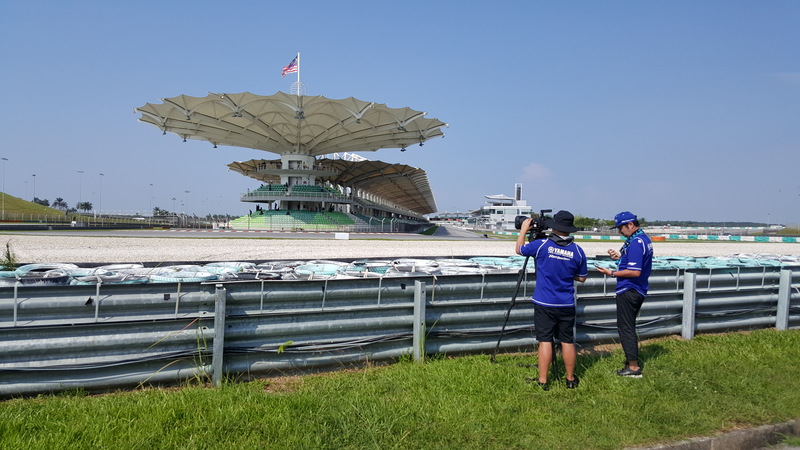 As such, Crash.net, Motomatters.com and Moto Journal jumped at the chance to join the new Aprilia test and wild-card rider trackside during the start of day two at the Sepang test. 'It's also bizarre, the different electronic ways of making the engine softer off the bottom of the throttle… Ducati does something different at the apex compared to everybody else… Yamaha almost holds something closed, then opens it on the exit… But maybe Ducati are using ignition, because you can hear the Ducati doesn't really change [engine speed sound] you just hear a 'brahahahap', whereas the Yamaha makes that slower, deeper, 'buuuuur' noise as the rider gets on throttle… Completely different'. 'The Suzuki is much more like the Yamaha… But it's about the whole package, engine, electronics, fuelling… There are many different ways of doing it'. 'It looks like Petrucci is not using the foot rear brake, he must be using it on the handlebar'. What was Maverick doing then? 'Maverick was re-setting his hand on the throttle in the corner. You release it and then re-grip the throttle in a different place'. 'A lot of riders are running straighter handlebars now… Before they were pointing more downwards… Possibly it's because with the Michelins corner speed is getting higher and picking the bike up is super important… It's easier to rotate your body if your hands are higher rather than super low down in the corner… More leverage, in theory'. 'There are lots of different riding styles, but no obvious right or wrong… Maverick has his style and won only three races ago… We spoke about Zarco, but he was on the podium two races ago… If that's your style, that's your style… You can hear that my team-mate Aleix doesn't like to use a lot of engine brake, for example'. The next day Smith, who had been riding the new RS-GP at Sepang during the earlier Shakedown, was called-up to take part in the conclusion of the Official test, in place of the absent Andrea Iannone. Reflecting on the opening MotoGP action of 2019, which saw Aleix Espargaro set the seventh fastest lap time for Aprilia, Smith said: "It's been a lot of fun, honestly. Because after a couple of weeks off the bike during the winter it was nice to get back to work again. "I'm really happy that the work that we did [in the test team] was able to transfer to something that Aleix liked and was immediately faster with from the first moment. To see the Aprilia doing a 1m 59.0 and inside the top eight means a great job by all of the team. "We've tried many things, trying to understand everything and give the guys a real picture of the motorcycle and the next developments to work on in the next few weeks before we arrive in Qatar. "But what a fantastic base to start from: Plenty of laps, plenty of information and now I'm sure the guys will come up with something more. "Overall I'm really satisfied. The bike is turning very well, Aprilia have done a big upgrade on the electronics from last year and everything is going in the right direction. "So we'll keep our head down and hopefully Aprilia will be ready to fight for a top ten in Qatar. "For me, I have to continue to do my test job, but obviously I'm also looking forward to doing the [wild-card in Qatar] where we'll aim to be closer and more competitive with Aleix and Andrea." Also at Sepang, Espargaro spoke about the importance of having Smith - a MotoGP podium finisher for Tech3 Yamaha, before two seasons at the factory KTM team - join the factory for 2019. "I'm very happy with Bradley. He is very humble, always asking me how I feel with the things he tries and if his indications are going in the direction I need," Espargaro said. "For me, one really young guy coming from racing only last season, I didn’t expect that, so first I have to say thanks. "Then obviously to have a test rider that is fast and riding a very similar pace and level to us is super helpful for the team and engineers. I really hope that Aprilia use him a lot to try new things and develop the bike. "In this era of MotoGP, everybody improves super-fast but our [race rider] schedule is full and we cannot do many tests. "From the example of Sylvain in Suzuki, Michele in Ducati, it’s clear [how important a strong test team is] and you can see the results. Also KTM did a good move with Dani, having already Mika, who is a very fast rider. "So we were missing this. Our test team now has a strong crew chief, good mechanics and a really good rider. So now we have to use this to try new things."